To Create a New Account for Phone Wagering, Click here! To qualify for $150 New Account Bonus, sign ups must use Promo Code TPB150 at Sign Up. Upon successful sign up, customer must then make $150 in qualifying wagers within 30 days of sign up. Customer has 30 days to use wagering credits. Unused wagering credits will be retracted after 30 days. Wagering credits cannot be withdrawn. 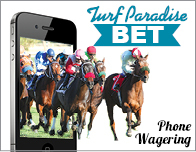 Advance Deposit Wagering (ADW), phone betting, is now in effect in Arizona. Sign up at www.turfparadise.com will be available on Tuesday.